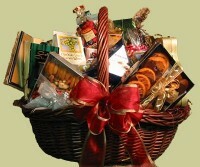 This epicurean delights baskets is an excellent array of gourmet products. We have included a tray of dried fruits and nuts, and a tray of Australian Apricots and Orange slices dipped in Belgian Chocolate. A large assortment that will please everyone.